Waste Bin Capacity: 9 gal. 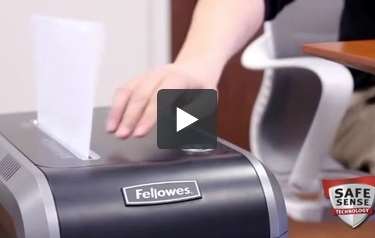 This 99Ms Micro-Cut Shredder from Fellowes is perfect for your home or small office. Boasting great features like auto-reverse jam protection, ultra quiet operation, and energy-efficient sleep mode, the 99Ms micro-cut shreds up to 10x smaller than standard cross-cut shredders. Including Safe Sense technology to prevent shredding when hands touch the paper opening, the 99Ms shreds over 10 pages at a time. It also destroys credit cards. The 9-gallon bin pulls out for convenient corrugate disposal. Rated at Level P-5 for security, the 99Ms comes with a 1-year warranty. Product number 4609001. Cut Size: 5/64" x 9/16"
Dimensions (HxWxD): 25.2" x 11.4" x 17.3"
It took so much time to get in, however this shredder reduces paper to "mush". A class 5 shredder that gets the job done with up to 11 sheets of 24 lb paper. When you turn a certain age, you will start getting so much junk mail -- all with more info about you that you don't want to put in the recycle bin "as is". I shred pretty much everything that has my name and address on it; a good practice in today's world. I have owned several different manufactures of shredders and have used the Fellows High Security shredder at work for years. When the last shredder failed I decided to try Fellows for Home/Office and everything about this model is excellent but would have liked it to run longer before temperature safety kicks-in (ideal would be more industrial motor and vents for removing the heat build-up). With a stronger motor you would be able to shred others items like CD's, etc. along with more sheets per pass, which would be terrific. It will shred Credit Cards fine but with more data formats that are in use today, it would be ideal to be able to shred them for complete ID security. For most home use this would never be a problem, but I think with slight changes to this model it would pretty much ensure long long life use. Cut size is excellent. Overall GREAT product functionality and performance. In my work office, we had a junk shredder, but we got this one to replace it. It has been great and is working very well for us. It is very sleek looking and does not make a lot a noise in our very small office. I think that the touch feature is very cool and love how it shreds paper to little confetti. Overall, it is a great purchase! Living with several adults in my household, personal shredders cannot come close to the durability and capacity of this shredder. Junk mail is the bread and butter of our postal service. I would continually put off shredding due to the amount of my personal time home shredders consume. In a world where privacy is at a minimum and one's name is sold over and over to marketing companies, my privacy is of paramount importance. When shredding marketing offers for several people, I am overjoyed that the Power shred 99ms can devour credit card offers and any unwanted junk, as well as files that are no longer needed. The Micro-Cut feature along with the 9 gallon waste bin was a major factor in deciding which model to choose. The shredded remains are "Micro" size just as stated by Fellowes, which lessens the number of times the bin needs to be emptied along with the paper remains being far superior in size than standard cross cut shredders.The security level is a P-5, which is at the higher end of the scale. The waste bin has an indicator stating when it is full, and the auto shutoff over the throat is a welcome safety factor. It also has a sleep mode that activates after a period of inactivity, which can be quickly resumed at the touch of a button. The information panel indicators are very helpful. I have wanted a large capacity shredder for several years and with the increase in unwanted mail, this purchase is well justified. Although it weighs 49lbs, having casters is a great feature that adds to portability and taking the mundane out of shredding. I purchase many items online, and this is the first review I have ever given, only because I value my privacy so highly. However, this shredder certainly deserves a rave review. The only improvement I would suggest would be a 10" throat width, but for all the wonderful features this shredder has, I can live with 9". It does not shred optical media, which wasn't a factor for me as I do my backups on external drives, for occasional optical media coarse sandpaper will destroy data as well as shredding. I assume that the reason optical media cannot be shredded is because the Micro-Cut fine shredding would cause too much heat on optical media. Overall, I am a well satisfied customer, and overjoyed to find a quality shredder with the major features I was looking for regarding my needs. Experience sleek design, innovative technologies, and hassle-free shredding with the Powershred 99Ms. This 12 sheet microcut shredder offers ultimate protection which shreds up to 10 times smaller than standard cross cut. The 99Ms can shred continuously for up to 15 minutes and includes a convenient 9 gallon pullout waste bin. It also powers through credit cards and staples. Safety also counts with Fellowes Safe Sense Technology which automatically stops shredding when hands touch the paper opening. And out auto reverse jam prevention feature stops and reverses out paper if a jam occurs. The 99Ms features SilentShred Performance ensuring the shredder is ultra quiet when use. It also features Sleep mode, our energy saving feature that shuts down the shredder after 2 minutes of inactivity. Experience innovation, power, and durability with Fellowes, the world's toughest shredders. Welcome to MyBinding Video. 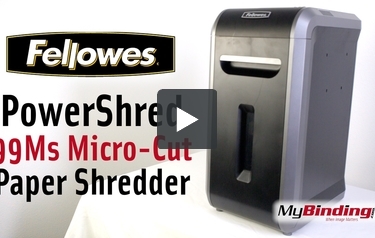 This is the PowerShred 99Ms Micro-Cut Paper Shredder from Fellowes. For a shred 10x smaller than other cross cut shredders, you need the 99Ms. This sleek, professional machine features superior performance and advanced safety mechanisms. Start by putting on the caster wheels by lying the shredder on its side, and pushing the casters until they lock into place. You can insert up to 12 sheets of 20lb. paper and the 99Ms will run for 15 minutes continuously before it needs to cool off. It’ll also chew through credit cards and CDs without breaking a sweat. The 9 gallon waste bin pulls out for easy disposal. Auto Jam reverse and Safety shutoffs in the waste bin and on the paper slot help reduce accidents. The 99Ms is backed by a 1 year manufacturers warranty and a 7 year warranty on cutting cylinders. For more videos and all your binding needs, visit MyBinding.com. Throat Width 9" 9" 9" 8.8" 9"
Unit Dimensions (H x W x D) 25.2" x 11.14" x 17.3" 25.2" x 11.14" x 17.3" 25.2" x 11.14" x 17.3" 25.63" x 14.5" x 10.5" 21.4" x 15.4" x 10.4"